The Austin-American Statesman maintains a web page (http://www.statesman.com/news/content/news/local/brackenridge.html) which contains information and articles concerning the future of the Brackenridge Tracts Muny golf course, biological field laboratory, and other portions of 345 prime acres along the Colorado River in West Austin. In a recent article by Asher Price (http://www.statesman.com/news/content/news/stories/local/2009/10/22/1022brack.html), it was reported that the recommendations from Cooper, Robertson & Partners LLP (CR&P) for the redevelopment of the Brackenridge tract call for denser construction than City of Austin rules would generally allow. Resolution of the conflict between the City’s rules and the development proposals will have a significant impact on the character and quality of West Austin as efforts are made to encourage growth without destroying the established West Austin neighborhood. 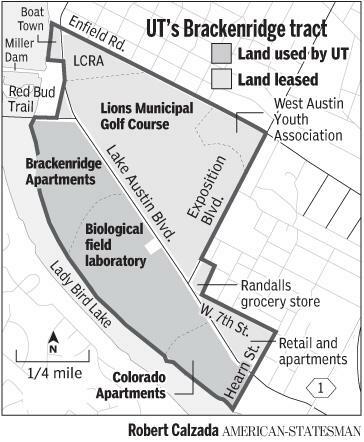 Recommendations by a consultant for the redevelopment of the Brackenridge tract , the 350-acre University of Texas-owned land west of downtown, call for denser construction than City of Austin rules would generally allow. The difference draws a line of control between the city and the university over the land and reopens a broader discussion of how to encourage growth in West Austin. The two plans by the New York-based consulting firm, hired by the UT SystemBoard of Regents, imagine the Brackenridge tract — now home to a municipal golf course, a university field lab, stores, offices, restaurantsand two-story apartment complexes along Lake Austin and Lady Bird Lake — redeveloped as a densely built, walkable, close-in alternative to suburban sprawl. The redevelopment plans call for about half the area as open space and half as development. The city’s current watershed regulations generally allow a maximum of 40 percent impervious cover, a technical term for asphalt and structures. “Overall, impervious cover assumed under both Plans would exceed that allowed by current City requirements,” according to the report released this month by Cooper, Robertson & Partners LLP. Under the plans, buildings would also be constructed closer to Lady Bird Lake than allowed in Austin’s regulations. The city’s waterfront overlay regulations impose development setbacks from the lake of between 300 and 400 feet. The Brackenridge Park concept plan proposes setbacks between 235 and 260 feet; the Brackenridge Village concept plan proposes setbacks between 228 and 350 feet. A 30-year agreement inked in 1989 between the city and the Board of Regents lays out development regulations less stringent than those proposed in the consultants’ plans and those currently on the books elsewhere in the city. Under the Brackenridge Agreement, setbacks are to be 150 to 200 feet, and the areas now covered by two apartment complexes can be redeveloped with up to 75 percent impervious cover, said George Zapalac, development services manager for the city. It’s unclear whether UT would have to follow city land-use rules when the pact expires in 2019. In the past, UT has argued that it won’t have to because it’s a state entity. The city has argued that its land-use rules would apply to nonuniversity structures, such as condos. “The Brackenridge Tract is an urban infill site and the plans are consistent with the City’s policies for densification within the City… and the reduction of sprawl in areas outside of the City, particularly environmentally sensitive areas,” the report says. Some environmentalists appear unlikely to be assuaged by the trade-off argument: Build here instead of out there. The impervious cover rules are meant to reduce the amount of rainwater runoff from streets and other paved surfaces, which in turn reduces pollutants carried into streams and into the river, Zapalac said. The setback rules are meant to preserve open space, the character of the shore and access to the river, he said. Because the plans are proposed and have not been accepted by regents, it would be speculative to address questions about impervious cover, according to Florence Mayne, executive director of the UT System’s real estate office. He mentioned, as an example, a deal reached last year about a proposed condo development on East Riverside Drive. The developer was allowed to build within setback limits of Lady Bird Lake in exchange for donating land to extend the hike-and-bike trail across the site and reducing the project size. In many respects the development plans for the Brackenridge tract propose an idyll of dense, mixed use redevelopment associated with environmentally progressive cities: The plans call for a network of bike trails and community gardens; energy efficient buildings; widespread rainwater collection; parks; and an extension of the hike-and-bike trail around Lady Bird Lake. The consultant was charged by the regents with coming up with plans that, among other things, promote sustainability and environmental friendliness, said Matt Flores, a spokesman for the UT System. In some places, environmental features of the proposed redevelopment are left vague. The three-volume study mentions “green roof technology” several times, but does not explain what that means exactly, or how the university would ensure builders comply. Rhetorically, too, the report discusses some environmental features in the passive voice, with little elaboration on how they will be implemented. Meanwhile, other parts of the report are quite specific. Bicycle lanes along city streets will be 5 feet wide. A multiuse trail will be 10 to 16 feet wide. Live oak trees will line Lake Austin Boulevard. Palm trees, cedar elm and red oak trees will line parks, promenades, plazas and the developed portions of the lakefront. At least 80 percent of the “plant palette” will comprise native and adapted plants well-suited to the area.